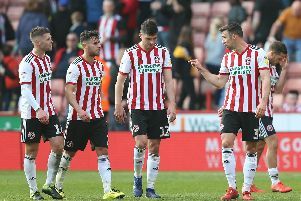 Why has one of Belgium's biggest newspapers just published this huge feature on Sheffield United? Among those in attendance at Sheffield United's home victory over Leeds United last weekend was a journalist from one of Belgium's biggest newspapers. Gazet van Antwerpen dispatched reporter Patrick Vincent to Bramall Lane to get the lowdown on the Blades. Interest in United has spiked in Belgium in the last week following news that Blades co-owner HRH Prince Abdullah Bin Mosa’ad Abdulaziz Al Saud was investing in Belgian club Beerschot Wilrijk. Gazet van Antwerpen's article had the headline 'Visiting Prince Abdullah, owner of Sheffield United, co-owner of Beerschot Wilrijk and boss of the largest producer of toilet paper'. So what were the Belgian journalist's first impressions of the Blades? United's iconic 'Greasy Chip Buttie' anthem clearly left a lasting impression on Patrick and the full lyrics are featured in the article. However, Patrick added: "Never make the mistake of ordering a chip butty when you are in Sheffield. It is no more than a double buttered toast with greasy fries in between." The journalist spent the match sat with Blades fans on the Kop and described the moments when Bill Sharp scored his two goals as 'special'. Before the match Patrick visited The Railway Hotel on Bramall Lane to chat to Unitedites. The pub's landlord told him: "Chris Wilder is one of us. Maybe even too much. "Last season, when the title was already done, we played a home game at noon.